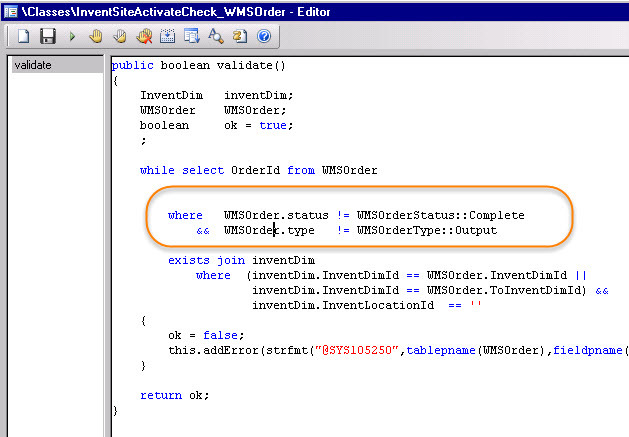 The validation code (InventSiteActivateCheck_WMSOrder.validate()) rejects all WMSOrders that have a from dimension with an empty inventory location. But at least in the WMSII case, these records are totally ok. Additionally, even if it was an issue, we still won’t mind if such an error exists on completed WMSOrders. 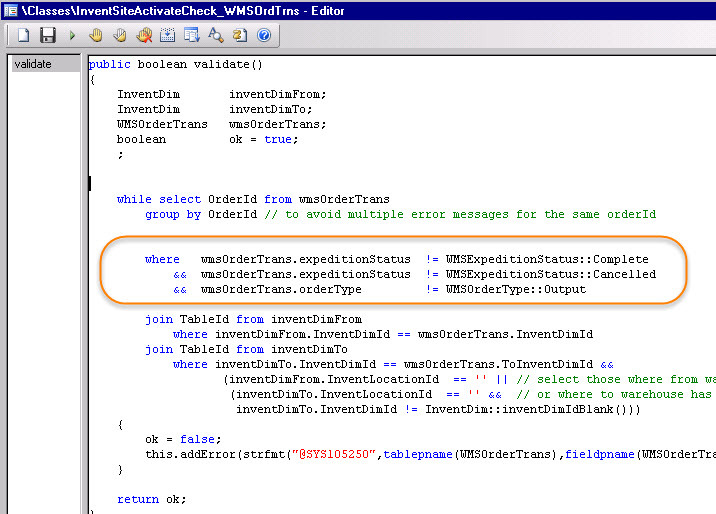 Same reasoning for WMSOrderTrans (InventSiteActivateCheck_WMSOrdTrns.validate()), but add cancelled transactions to the „we don’t mind“ case. This report (Administration > Reports > System) doesn’t work correctly, because their parameters are not handed over to the server execution. It’s easily fixed by adding the standard pack / unpack methods. To check whether your modification works, set a breakpoint in the report’s fetch method and verify that the inventSiteIdDefault and inventLocationIdDefault member variables are set as you specified in the Dialog. If you have custom Dimension fields on InventDim, add them to Table InventDimInsTemp. ← Broken Alerts? Bad Wizard!